Please refer to our stock # 39 when inquiring. 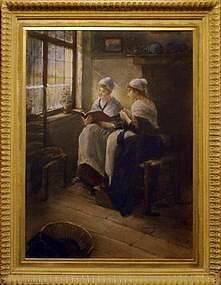 "The Reading" Watercolor on paper, 23.25" x 17.5" unframed Paul Doering is a Dutch artist born in Holland, He studied under the artists Joseph Israels and B. Lommers. He migrated to New Orleans, Louisiana in the late 1880s and was active in the art scene of Louisiana. He then migrated to Laguna Beach, California in 1911. He was very active in the southern California art scene through the 1930s. He is listed in the Who's Who in American Art" as well as the Artist's Blue Book 2005 Edition. During his lifetime, Mr. Doering exhibited in the Artist Association of New Orleans, Cicinnati Art Museum, and Detroit Art Museum as well as in numerous private exhibitons all over the United States. His watercolors are as exquisite and beautiful as the great master Israels'. Giuseppe Aureli (1858-1929) Augusto Daini (1860 - 1920) Paul Grimm (1891 - 1974).